Lesson 1 provides an overview of many of the rich new features in Silverlight 4 and as well as the new built-in designer available in Visual Studio 2010. In this lesson we’ll discuss some of the new dynamic features in Silverlight 4 including printing support, enhanced ImplicitStyles support, right click and clipboard support, adding drag and drop functionality to Silverlight applications, client authentication, MEF, webcam support, and more. In this lesson we’ll cover out of browser features, including elevated trust and how it can be used to tie Office and COM applications into your Silverlight application and also more easily access the file system. Other features such as the WebBrowser control will be covered, as well as Notification (Toast) Windows. 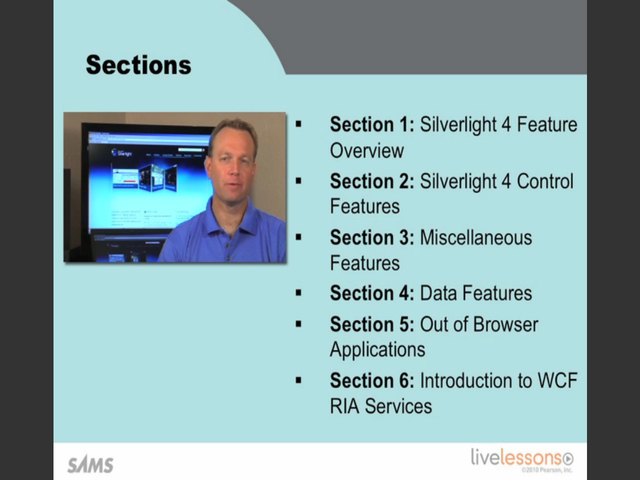 In Silverlight 4 Development LiveLessons online video training,MVP Dan Wahlin helps you quickly master Silverlight 4’s hottest improvements! Click, watch, and discover Silverlight’s improved controls, styles, printing, authentication, webcam support, data binding, new Managed Extensibility Framework, out-of-browser application support, WCF RIA Services, and more! Learn at your pace through realistic examples…and get productive fast! Dan Wahlin founded The Wahlin Group (http://www.TheWahlinGroup.com) which specializes in .NET, Silverlight, jQuery and SharePoint consulting as well as onsite and online training solutions. He has been awarded Microsoft's MVP award for ASP.NET, Connected Systems and Silverlight. Dan speaks at conferences and user groups around the world and has written several books on .NET such as Professional Silverlight Development, Professional ASP.NET 3.5 AJAX, ASP.NET MVP Hacks and Tips and XML for ASP.NET Developers. Dan blogs at http://weblogs.asp.net/dwahlin and writes regular columns for various print and online technical publications.